As I mentioned in Monday's options recap post, last week was an extremely busy week with over 25 different positions being put on, taken off, expiring or being rolled. That level of activity easily makes it my busiest week yet for options trading. Part of that was due to having a new bit of capital available due to my new TastyWorks Roth IRA, but a lot of that was also just a confluence of good opportunities and having cash available to trade. With so many moves to cover I decided to split the post in two. Monday's post covered the new and rolled positions and today I'll cover all of the closed positions. I sold this put option just a couple days after news broke that Toronto Dominion had been placing their employees in a "high pressure sales environment" leading to a 5% drop in Toronto Dominion's share price in just 1 day. That was fine by me because it led to both a lower share price and higher volatility which meant better option premiums. This trade produced net profits of $59.91. Based on the $5,000 of capital securing the contract that's a solid 1.20% return in just over 1 months time. That equates to a 13.2% annualized return. I was able to capture 48% of the maximum profit in about 90% of the days until expiration. While I'd prefer that to be a higher ratio I can't complain at locking in profits, especially when Toronto Dominion's share price is currently below what my effective purchase price would have been. 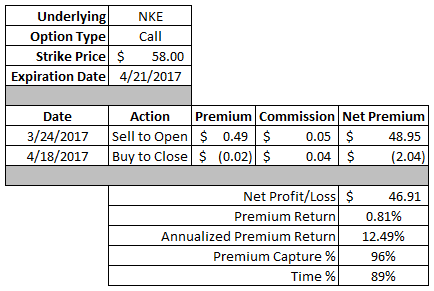 Ever since purchasing shares in Nike I've been writing calls against those shares in order to collect more premium and lower my cost basis. This covered call produced net profits of $46.91. That's a decent 0.81% return based on the $58 strike of the call option. The annualized return on that works out to 12.5%. I was able to capture 96% of the maximum profit in 89% of the days until expiration. I've started experimenting more with defined risk strategies, namely credit spreads and iron condors. Much of the reason behind that is with my new Roth IRA account at TastyWorks my capital is small so I'll need to limit myself to defined risk strategies there in order to have several positions on at one time. This credit spread generated net profits of $21.82. That works out to an excellent 31% return on the maximum potential loss of $70.09. I was able to capture 73% of the maximum profit in 87% of the days until expiration. While I likely could have just let this one go until expiration I didn't want to risk seeing my profits get wiped out. Lowe's share price was hovering relatively close to the $81.50 short strike throughout the week and the markets had started to show a bit of volatility. So it made sense to go on and close the position instead a bit early to ensure that I had profits instead of trying to squeeze the last bit of juice from this position. In hindsight I shouldn't have even put this position on in the first place. I neglected to look at when Visa's earnings date was and unfortunately it coincided with the week this spread was expiring. For those unfamiliar with options trading that meant that I wasn't likely going to have a chance to close this position out early because implied volatility, and option prices, would expand until earnings were released. This credit spread generated net profits of $12.87. Based on the maximum potential loss of $205.09 that's just a 6% return on capital. I was only able to capture 29% of the maximum profit in 100% of the days until expiration. One thing you'll notice is that I closed the position out in 2 steps, well one really, instead of just at once. Visa's share price saw a nice jump prior to earnings that gave me the opportunity to close out the short put portion of the spread on April 20th. With earnings being released after the market close that day I figured it was worth a shot to keep the long put portion of the credit spread on in case something crazy happened with earnings and Visa's share price sold off the following day. Unfortunately that didn't happen so I left money on the table instead of selling out the long put too, but it was a risk I was willing to take since I had already booked profits on the trade. If United Parcel Service was trading closer to the middle of the $103-108 range of the iron condor I likely would have just let this one play out. However, the share price had been flirting with the $104 level early in the week and this was another situation where it made sense to try and close it out prior to expiration and lock in profits rather than risk seeing the paper profits turn into realized losses. I was able to realize profits of $24.64 on this iron condor. Based on the $74.18 maximum potential loss that's a 33% return on capital. I was able to capture 95% of the maximum potential profit in 93% of the days until expiration. I'd really like to see Union Pacific back closer to $100, but the market will do what it wants to do. I went with an iron condor which is a neutral strategy where I was essentially making a bet that Union Pacific's share price would stay between $103 and $110 while the trade was open. Lucky for me that's just what it did. My realized profits on this iron condor came to $29.64. Based on the $165.18 in capital at risk on this trade that's an 18% return on capital. I was able to capture 85% of the maximum potential profit in 93% of the days until expiration. Target's slide over the last few months has been a sight to see. While I'm not enthusiastic about B&M retail I also don't think Target will be going anywhere anytime soon. Since I own shares and also have an open put option I didn't want to take the risk of potentially adding more shares which meant I needed to use a defined risk strategy as a way to essentially say the bleeding has to stop sometime. Enter the put credit spread. This put credit spread generated net profits of $19.82. Since the maximum capital at risk was $68.09 that's a solid 29% return on capital. I was able to capture 62% of the maximum profit potential in 53% of the days until expiration. Options might seem complex, but they can be extremely useful when used right. For example I purchased shares of CVS back in mid-January at $83.20 per share. If I'd have done nothing with those shares I'd just be sitting on a paper loss right now of about $3.15 per share. However, by trading options around the position I've been able to collect $468.18 in profits that go to reduce my cost basis on the position. 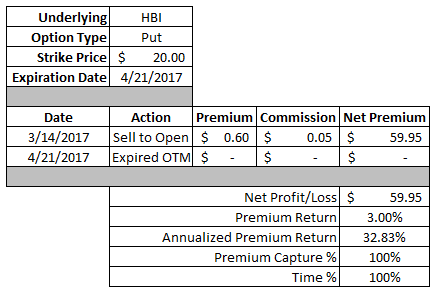 That swings my per share cost basis from $83.20 to $78.52 and swings the paper gain/loss from a $3.15 loss to a $1.53 gain. This put option was originally part of a covered strangle position that I had on CVS, but decided to roll out in time earlier this month since CVS' share price was hovering around the short put strike of the strangle position. 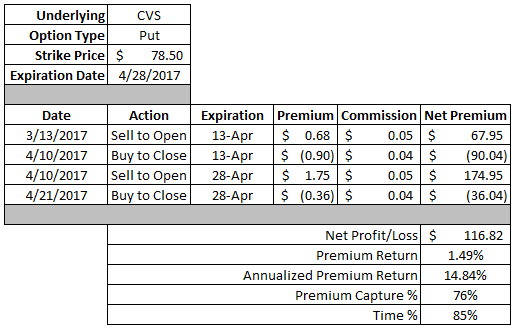 With CVS' share price moving higher since then I took the opportunity to close out the put option and lock in some profits. I was able to realize $116.82 in net profits on this put option. Since $7,850 was set aside to secure the contract that's a 1.49% return on capital. The annualized return works out to a solid 14.8%. I was able to secure 76% of the maximum profit potential in 85% of the days until expiration. When I sold this put option Hanes Brands' shares had just taken a beating and if I remember correctly the share price was actually slightly below my strike price. If this had been a higher priced stock I probably wouldn't have done this trade; however, with only $2,000 of capital needed to secure the contract I was just fine taking on the risk. This put option worked out fantastically for me and I was able to keep the full option premium as profits. The $59.95 net profits works out to an excellent 3.00% return on the $2,000 that was securing the contract. The annualized return on that is 32.8%. This call option was opened just a couple weeks back as part of a buy-write where you purchase shares and simultaneously sell a call against them. My idea was to generate some quick profits via the dividend and call premium and have the shares called away, but since Colgate ended lower than my strike I still have the shares. This call option produced net profits of $68.95. Based on the $74.00 strike price that's a 0.93% return in about 1.5 weeks. The annualized return works out to 40.3%. I had purchased shares of Colgate at $73.74. The call premium reduces my cost basis to $73.05. Since I'm not eager to own shares at this valuation I'll be looking to sell a more aggressive call option which should work out nicely since earnings are due out this week as well. This one didn't go as planned, but that's what happens when you're dealing with a large set of unknowns. In retrospect the problem was that I didn't pay attention at order entry to when the earnings release was for Johnson & Johnson and it happened to be the week of the expiration that I chose. Even though implied volatility wouldn't expand to anything crazy, there was still going to be volatility expansion as earnings approached which meant there would be a smaller likelihood of closing out the position early. 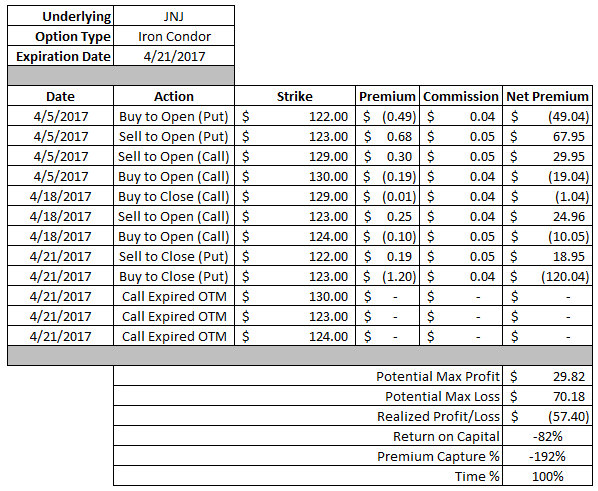 The original iron condor was set up to provide a maximum profit of $29.82 with a maximum potential loss of $70.18. Unfortunately, things went awry after Johnson & Johnson reported earnings last week and the share price sold off to around $121. That's exactly what I didn't need to happen with just a few days to go until expiration. Since this was a defined risk trade I could have just let it go; however, I decided to play a little bit of defense and convert the iron condor into an iron fly, an iron condor with both short strikes being the same. I was able to pick up an extra $15 of option premium on that, but this was more just to limit losses than to turn profits unless I happened to get lucky and Johnson & Johnson's share price recovered to right around $123. Johnson & Johnson's share price price remained below my $122 long put option which meant there wasn't really anything else to do. I contemplated rolling out the short $123 put option in time, but decided that for simplicity it was best to just let this trade go. After accounting for the defensive roll into the iron fly this trade generated a net loss of $57.40. While I don't want to see that it's still slightly better than the $70.18 maximum potential loss of the original position thanks to playing a little bit of defense. While I'd love to build up a large position in Visa I just can't bring myself to do so at these valuations. Despite the truly excellent growth that Visa has delivered and should continue to do for the foreseeable future, I just can't justify giving up so much of my returns to the eventual valuation compression. However, that doesn't mean I won't own shares from time to time and sell call against it which is exactly what I did with this trade. I left some money on the table here since Visa's share price was trading around $91 on Friday, but that's the risk you take on when selling call options. 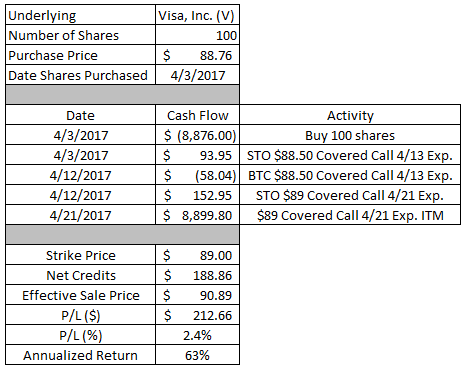 I originally purchased the Visa shares on April 3 as part of a buy-write call option for $88.76 per share and collected $93.95 in option premium. 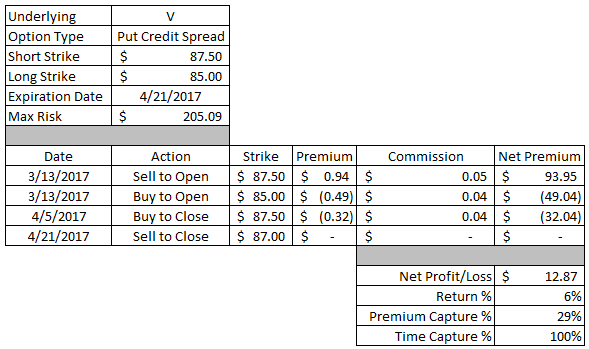 As that contract approached expiration I took advantage of the higher earnings related implied volatility and rolled out the call one week and up in strike price while taking in nearly an extra $100 in option premium. Since Visa's share price was higher than my $89 strike the call option was ITM and the shares were called away from me. My effective sale price was the $89 strike price plus the total credits received of $188.86 giving a sale price of $90.89. The net profits on this trade worked out to $212.66 or a 2.4% gain based on my cost basis. The annualized return works out to 63%. My preference is to just take my profits and run and if that can't happen then roll the position out in time to try and get my profits then. Sometimes though it just doesn't make sense to do. I tried rolling this contract out further out in time, but there just wasn't enough premium on the roll compared to taking the shares and then selling calls against them which is what I intend to do. So I'm now the proud owner of 100 shares of Pfizer in my Rollover IRA. The put option's strike price was $34.50 and the total credits received, including one previous roll, came to $71.86. That puts my effective purchase price of Pfizer at $33.78 per share. 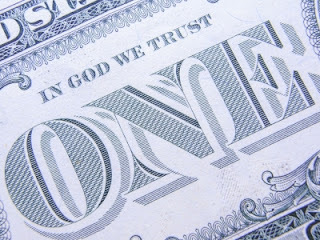 Based on the current annual dividend of $1.28 these shares carry a YOC of 3.79%. Similar to the Pfizer put, there just wasn't enough money to be made by rolling this contract out in time. That's usually the case when you're dealing with the lower priced underlyings and the best option is usually to take the shares and then sell calls. The strike price of this put option was $23 and the total option premium that I collected amounted to $44.95. The option premium reduces my cost basis putting my effective purchase price at $22.55. Based on the current annual dividend of $0.30 these shares carry a YOC of 1.33%. Since I already have a rather hefty position in Bank of America, I'll be looking to be rather aggressive with selling call options against these shares with either ATM or 1 strike OTM being the likely options that I sell. Very nicely done. I don't quite know how to do options, I think thye are done differently here in Australia. All the best. I think most other countries just have European style options, essentially that you can't execute the contracts early only expiration. Although I'm not sure what Australia uses. Options might seem complex but even in it's most simplest form, selling a put or call, it's essentially the same thing as setting limit buy/sell orders except you get paid to wait via the option premium. Just bought some TGT and I am hoping to average down on CVS next. What do you think of the state of retail in the next 10-15 years? I think retail is pretty hard to tell right now. I personally don't think we're going to see B&M retail completely go away which many seem to be calling for. But I do think B&M retail as a whole is going to need to contract because there's just so much retail space per capita in the US. Over the next few years I think the companies that will do best in the B&M space is the very high end, where there's brand status, or the very low end, like WMT. Target is kind of in the middle ground which is what I think is going to have the roughest go while they sort things out. I still think they will sort things out and hope they can build back some goodwill with consumers after the bathroom debacle. In the few Target's that I visit I know the traffic when I've gone in there has been much lighter than I would have expected. I did something similar with CL as you. On Mar 21, I did a buy/write call, buying CL at 73.91 and selling an Apr 21 72.50 call for $2.53. 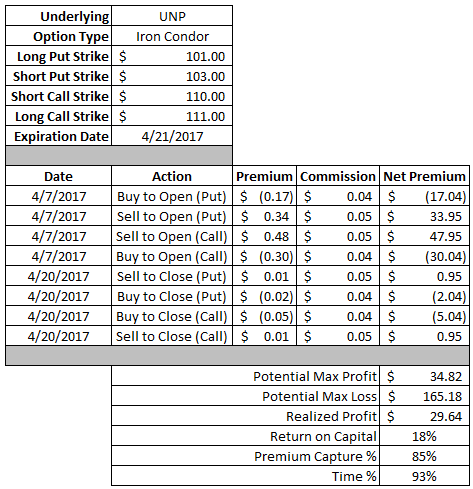 The call was exercised on Apr 18 (x-dividend on Apr 19) for a profit of 1.12 (72.50 + 2.53 - 73.91) 32 days 16.8% annualized. If the option expired on Apr 21 my cost basis would have been reduced to $70.98 (73.91 - 2.53 - .40 div)and I would have sold another covered call. Obviously I like the move since I did something similar. With CL's valuation right now I'm not interested in a long term buy and hold position, but I'll definitely take advantage if I see something that intrigues me. The spreads are interesting to read. I haven't done any spreads in at least a year. I find them "cute" but feel they require more brain power and more monitoring. I have "enough" with just straight puts/calls and don't feel the need to push myself that way. I like them in theory because it let's you get a lot of positions on so you can let the probabilities work out, but they do have the big downside of being limited profit potential. I probably wouldn't be doing as many spreads if I didn't have my small $4.5k IRA account. Since capital is so limited spreads are kind of the only way to go for that account. I much prefer just selling calls/puts and that's what I've done with the majority of my moves, but I still want to try and mix in some other strategies to see how things go.